”Twitch“ plays a computer game automatically by controlling the person that is attached to it. 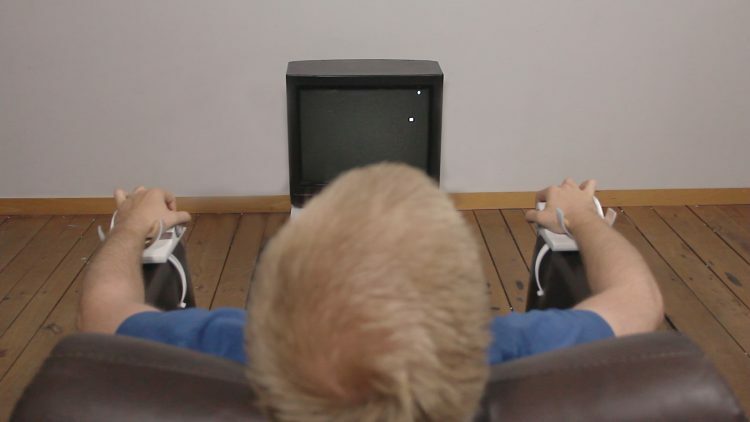 This man machine symbiosis shows a new way of experiencing the act of gaming. It lets the user not only feel the signals that are needed to progress within the game but actually forces them to press the appropriate buttons with electrical shocks. The machine calculates the perfect path within the game and executes it through the human. The computer plays a particular version of the game ”Snake“ automatically where an algorithm calculates if the snake has to move up, down, left or right next. The computer itself can not move the snake. It can just send signals to electrodes on the controllers. Each controller can receive two different signals. Every received signal lets a different finger twitch and unwillingly press one of four possible buttons. Pressing them moves the snake within the game into the right direction and starts the next calculation loop. The human has not to do anything actively. The game plays itself by activating the right buttons at the right time. However, without a human, the system would not work.